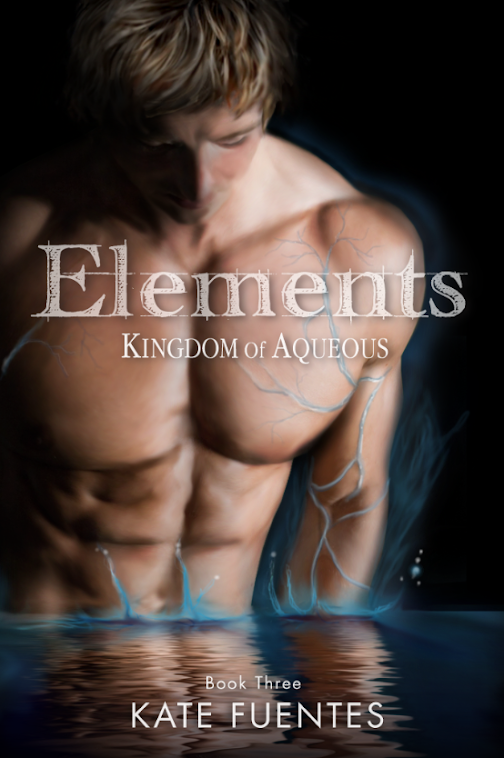 Today I would like to welcome author Ardyth DeBruyn. 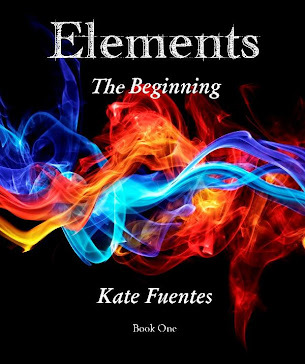 She is one of the many authors involved in the Summer Teen Reading Party event and has graciously agreed to be a guest on Sired Scribblings and has included an excerpt from her latest book! Thank you for hosting me, Kate! The Summer Teen Reading Party has been a blast this month. It’s going to be a great summer. I always used to check out a huge stack of books from the library when I was a teenager. Now it’s even easier to pile up the books on my reading pile with the e-reader. I was always the sort of kid who liked to make fun of everything, even things I really enjoyed, because I never could resist a good laugh. Who says you can’t be both serious and funny at the same time? So, it’s no surprise that when it comes to writing, humor and satire is what I really enjoy. I love reading serious stories as well, but when I sit down to write, I find I take my favorite ones, and twist them around for a good laugh. My first novel “Chosen Sister” uses a lot of standard high fantasy conventions and some of my favorite parts of “Lord of the Rings” to tell a story that’s both satirical, but also has a serious plot and character journey underneath. I like chosen one stories, even if they’re overdone, and the fact that they are, makes for a lot of good laughs. I’ve always also been a fan of “Harry Potter” and all the accusations in the news about the books being “evil” made me roll my eyes, but also got my brain going. What would an evil magic school actually be like? And how funny could I make it? 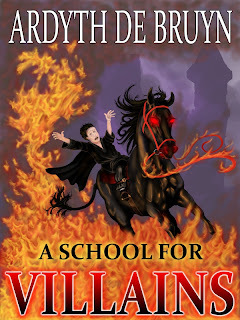 Thus was born my second novel “A School for Villains.” I actually wrote both books at the same time, but found pure satire harder to write than my semi-serious first novel, and thus took longer to revise it. I plan to try a sequel this year. Reina’s brother Austyn has been declared the Child Warrior, but he’s only six. What’s a big sister to do? Allowed to accompany her brother, Reina discovers they’re in deeper trouble than she thought-the Gold Wizard isn’t shaping up to be the guide he’s supposed to be and the Red Wizard’s harpies and snakewolves are on their trail. If anyone’s going to find a way to track down the elusive Sword of Chivalry for Austyn and get him into the Red Wizard’s castle to fulfill whatever it is the obscure prophecy insists must be done, it’s got to be Reina. 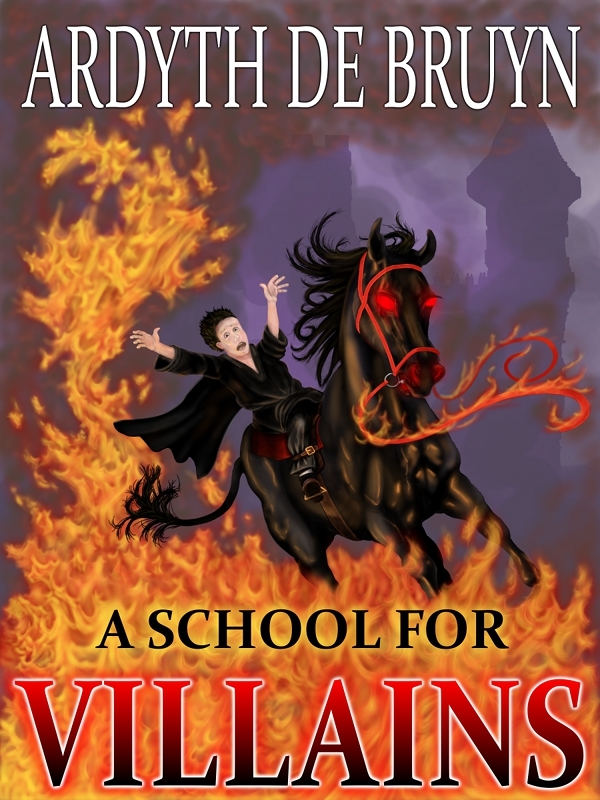 Thirteen-year-old Danny is astounded when his father decides to send him to Dark Lord Academy to learn to be a villain. Pa claims it will make him stand out and fulfill his own lost childhood dreams. Being evil doesn’t appeal to Danny, but he’s always been a good and obedient son, so he goes. Dark Lord Academy’s not just unappealing, it’s downright terrible. His advisor dyes Danny’s blond hair black and changes his name to the unpronounceable Zxygrth. He can’t get the hang of maniacal laughter, his second-in-command servant is a puke-colored monkey, and the cafeteria lady enjoys serving stewed cockroaches or fried bat wings. A run in with a hero results in hate mail and he gets caught up in a rivalry with the school bully. The only way for Danny to stay alive is to find his inner villain. Wham! He slammed into something hard, tangled with it, and fell. Danny tensed, gripping at the wood, suddenly afraid he’d get knocked off the drawbridge. “Oww, watch where you’re going!” He’d run into another person. Danny pulled himself free and turned to meet the gaze of two bright blue eyes. It was a boy, perhaps a year or two older. The boy rubbed his head, mussing up his red-blond hair. He wore a bright red tunic and purple pants and was that a hint of glitter on his cheeks? Danny stared. “Aren’t you?” Danny realized the second he said it that Alec was too brightly colored and honest-looking to possibly be a fellow student. “I am a hero!” Alec drew his sword. “I’m stuck here, too, and I’m unarmed,” Danny protested. 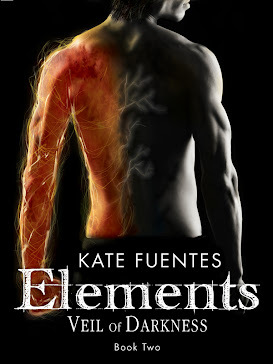 He glanced first right, then left; nothing but lava. This was not looking good. “It’s not fair to attack me. Isn’t killing unarmed people against the rules?” He had no idea what the “rules” of being a hero were, but it was worth a try. “Hah! I’ve got a spare.” To Danny’s dismay, Alec reached behind his back to pull out a sword. It was half as short as Alec’s regular one, but looked just as sharp. He held it out, making Danny take another step backward. “Why don’t I just surrender and you take me prisoner without a fight?” Danny suggested. That’d at least get him out of the school, right? “No can do, I have to infiltrate Dark Lord Academy and defeat a villain before I get the extra credit badge. We’ll have to fight, although if you beg for mercy like the coward you are, I might consider sparing your miserable life.” Alec bent and slid the sword toward Danny across the wooden planks. Alec didn’t give him an opportunity to make up any further explanations—he attacked with a war whoop. Ardyth, thank you for dropping by Sired Scribblings and giving us a taste of your interesting novels. We wish you great success and will watch out for more fabulous books!